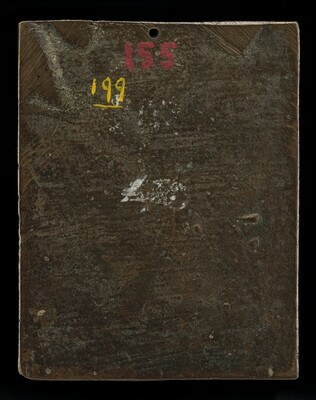 Reverse bears reference and former inventory numbers 202 in faint white paint (Molinier no., effaced), 476(?) in heavier white paint (Bange no.? ), 155 in red paint (Dreyfus), and 199 in yellow paint (Ricci 1931). Image and Word, Elizabeth Myers Mitchell Art Gallery, St. John's College, Annapolis, Maryland, 1989, no. 23. Molinier, Émile. 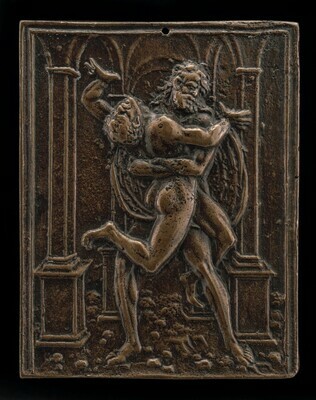 Les Bronzes de la Renaissance. Les Plaquettes; Catalogue Raisonné. 2 vols. Paris, 1886:, 1:148, no. 202. Migeon, Gaston. "La collection de M. Gustave Dreyfus, V: Les plaquettes." Les Arts 80 (August 1908): 30, pl. 19, fig. 9. Ricci, Seymour de. The Gustave Dreyfus Collection. Reliefs and Plaquettes. Oxford, 1931. vol. II, 150, no. 199, pl. 63. National Gallery of Art. Renaissance Bronzes: Statuettes, Reliefs and Plaquettes, Medals and Coins from the Kress Collection. Introduction by Perry B. Cott. Washington, 1951: 152. Pope-Hennessy, John W. Renaissance Bronzes from the Samuel H. Kress Collection: Reliefs, Plaquettes, Statuettes, Utensils and Mortars. London, 1965: 50, no. 163, fig. 159. Image and Word. Exh. cat. Elizabeth Myers Mitchell Art Gallery, St. John's College, Annapolis, Maryland, 1989. Lewis, Douglas. "The Plaquettes of 'Moderno' and His Followers." Studies in the History of Art 22 (1989): 113, 140, no. III.A.2. Gregori, Mina, ed. In the Light of Apollo: Italian Renaissance and Greece. 2 vols. Exh. cat. National Gallery and Alexandros Souzos Museum, Athens, 2003-2004: 1:378.